Many industries experience prolonged periods of rapid change before settling to a more stable market structure. The changes may be exogenous in nature, arising from shifting competitive dynamics, technological advancements, etc. Companies may also experience voluntary and involuntary internal transformations, such as changes to company's management, installation of new equipment, etc. When these prolonged periods occur, strategy in its classical sense of the word may be detrimental to the well-being of a company. Strategy requires commitments and commitments may become a burden when the industry's structure is rapidly evolving. For instance, fixed assets associated with high volume – low cost production can quickly overstrain company's financials, should the demand for manufactured products fall due to technological obsolescence. In the case of Polaroid, the company's strategy was closely associated with offering instant film cameras, which quickly became obsolete with the introduction of digital technology. This lead to the eventual demise of the company. 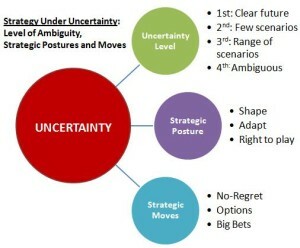 Given that commitments may be detrimental to company's operations during the times of change, business executives must look for alternatives to the classical strategy theory. Instead of long-lasting strategic postures and commitments, fundamental change may be best addressed by short term tactics and good enough solutions that resolve the issue at hand. These are likely to work better in safeguarding firm's survival than strategic approaches that work best when the industry structure is stable. 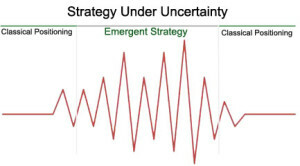 During uncertainty, firms should move incrementally and act entrepreneurially in an effort to capture rapidly disappearing opportunities. This approach may be called an emergent strategy, a strategy that relies on flexibility, innovation and operational excellence. At the same time, firms should learn to improvise and try out new things. When the market forces stabilize, a firm can again adapt a classical positioning strategy. 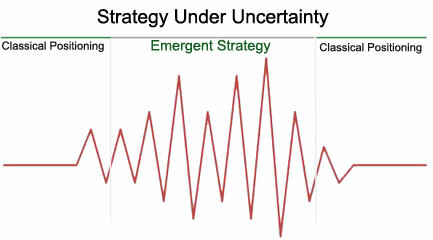 Firm’s strategy adaptation can be viewed in the below graphic, where the red line represents volatility in the market place. An alternative approach would be to redefine what is meant by strategic commitments. Instead of investing into stable manufacturing facilities and defining long-lasting strategic postures, firm's strategy may be rooted in its fundamental capabilities and resources. These may be employees' learning abilities, flexible equipment and sourcing, etc. Apple is a notable example of a company that had successfully adopted a flexible strategy. Although, the company is a leader in the smart phone and tablet markets, its innovations are quickly copied within months or even weeks of product introduction. It is difficult to maintain competitive edge, when the industry dynamics are as rapidly evolving as they are in these markets. One of the ways, Apple continues to hold its leadership positions, is by the use of its iTunes – App Store Model, a unified system that serves various devices while supporting further growth. iTunes is an innovative resource that provides flexibility while strengthening firm's positions. Another key resource is Apple's team of executives who are renowned for their skills and continuous pursuit of innovation. Effectively, the company's strategy is enrooted in its people and its innovation processes and not in unnecessary fixed assets or expensive commitments. This is further confirmed by Apple’s introduction of the iPhone, which in many respects, has had a cannibalization impact on company’s sales of iPods. A different company may have maximized the returns from its highly successful product that iPods were before introducing another hand held device. However, Apple is not an ordinary company. Their pursuit of innovation had led to redefining the market with the introduction of the iPhone. The same has been later repeated with Apple's iPads, which are likely to have a negative impact on sales of Mac laptops. From the classical strategy point of view, this behaviour may seem imprudent. However, Apple is well aware of the industry it is operating in. The company knows that only continuous product innovations can maintain its leadership positions in the long run. When the industry structure is unstable and is rapidly evolving, it is best to adapt an emergent strategy, addressing issues as they arise, while maintaining flexibility and operational excellence. Furthermore, a strategy that is enrooted in human capital and innovation capabilities is better suited for these times of uncertainty. classical sense of the word may be detrimental to the well-being of a company. approaches that work best when the industry structure is stable. This is further confirmed by Apple's introduction of the iPhone, which in many respects, has had a cannibalization impact on company's sales of iPods. A different company may have maximized the returns from its highly successful product that iPods were before introducing another hand held device. However, Apple is not an ordinary company. Their pursuit of innovation had led to redefining the market with the introduction of the iPhone. The same has been later repeated with Apple's iPads, which are likely to have a negative impact on sales of Mac laptops. From the classical strategy point of view, this behaviour may seem imprudent. However, Apple is well aware of the industry it is operating in. The company knows that only continuous product innovations can maintain its leadership positions in the long run.